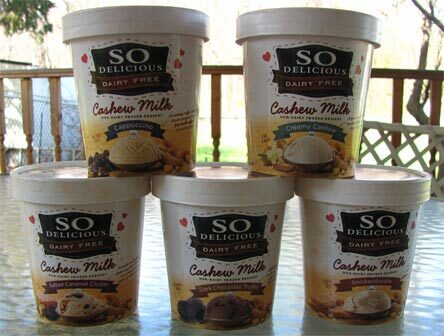 [By Nick] Recently So Delicious sent me their entire line of cashew milk frozen desserts. Instead of reviewing them individually, I thought it would be best to cover all 5 flavors in one post. When I heard So Delicious was releasing a cashew line I was very curious. There's a very slim amount of cashew milk frozen desserts on the market and I believe So Delicious is the first mass-distributed line up of its kind. With flavors like snickerdoodle, how could I not want to try this line out? Let's start with the basic flavors and work towards the more complex ones. "A gourmet delight with a touch of fair-trade vanilla and a pinch of sea salt." This one tastes as it is described. The cashew nuttiness is in the forefront with a bit of vanilla rounding things out. The sea salt isn't really noticeable and blends in with the cashew flavor. The texture is creamier and more reminiscent to traditional ice cream than both their coconut and soy line. I haven't tried any of their almond milk flavors so I can't speak for them. (For now on, unless noted the texture is the same throughout the flavors to save room and stop me from repeating myself which will drive Dubba insane.) This one is good even if basic. It's hard to find anything with cashews and this one will fix that craving easily. "A creamy coffee-love's dream prepared with fair trade beans and a touch of spice." The flavor here isn't too strong on the coffee front. It's very milky with a coffee finish. The nuttiness of the cashew milk is still there but not as strong as in the last flavor. I'd imagine this would taste exactly like an espresso that used cashew milk to be honest. Another simple but properly executed flavor. No complaints for me minus the whole lack of any sort of spice. I'm guessing they were talking about cinnamon looking at the ingredients but I didn't notice it at all. "A fair-trade cocoa decadence folded with fudge and premium shaved chocolate." The texture here is a little different. I'm not sure if it's due to the added cocoa element but it's drier and not as creamy. The chocolate flavor is fine albeit not too dark. It kind of reminds me of a generic chocolate base. Not bad, but nothing special. The name of this flavor bugs me a little. I get overall their going for a truffle flavor with the chocolate and fudge separate. However, when you put truffle in the name I want there to be truffles. The shaved chocolate and fudge aren't too prevalent and only add a textural change since the flavor blends with the base too much. The fudge stands out a bit more than the shaved chocolate but only to add a richer flavor to the base. If you have to go dairy free, there's better chocolate options on the market. "A sweet and salty delight featuring chocolate covered cashews and a ribbon of salted caramel." This was my favorite out of the bunch. The texture returned to normal, possibly a bit more creamier to be honest. The flavor is what had me. It tasted like caramelized cashews. Caramelization of nuts are one of my favorite preparations and this one had me from first bite. The saltiness of the swirl isn't too strong but still manages to let you know it's there. ? And I'm not a fan of their naming process. Chocolate covered individual cashews do not equal clusters. The "clusters", once again aren't ample. It's a shame because they add that sweet contrast to the saltiness of the swirl. Still, it's a tasty combo and I would happily eat this one over and over again. "A cinnamon delight loaded with chunks of gluten-free snickerdoodle cookie dough!" Last up is the flavor I was excited the most for. Let's just say, I was let down a bit. First off, the texture wasn't as good as I had hoped. It wasn't as dry as the dark chocolate truffle but it wasn't as creamy as I experienced in the other flavor. I blamed the cocoa element in the other so I guess the cinnamon did the same here. The flavor of the base was excellent. Remember Dunk-a-roos? Well that's exactly what this tastes like. Better way to sum it up, it tastes like cinnamon infused frosting. I could eat this base for days if it wasn't for the dry characteristic I was experiencing. The major let down came from the snickerdoodle cookie dough. I literally got two chunks throughout my whole pint. I don't know why So Delicious is being so stingy with the mix-ins in the line but it really stopped all 3 of these flavors from reaching their full potential. Even with the off texture, the addition of more cookie dough could've made this my favorite flavor. Final Thoughts: I'd like to thank So Delicious for letting me try out their new cashew milk frozen desserts. I was surprised by just how good they were and would be willing to purchase all of them besides the dark chocolate truffle. Have you tried any of the flavors from this line yet? If so, let me know your thoughts in the comments. If not, which one would you want to try the most. Oh and thanks for reading another extremely long post from me! They have tons of coconut flavors, but coconut (and coconut non dairy ice creams) are so nasty I wouldn't eat em if they paid ME. Stores carry a hilarious amount in stock that never seem to deplete either, lol. I am not surprised that they were good because So Delicious almost always delivers a delicious, high quality product. I just wish their prices weren't so high. This was a great review! You should review some of the other So Delicious desserts as well! 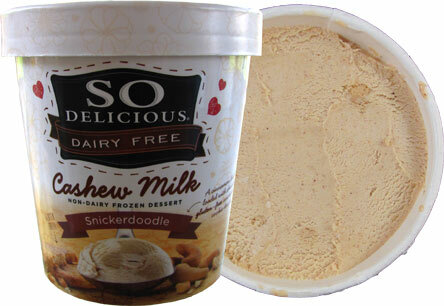 Hope you'll be willing to give the Snickerdoodle flavor another chance, with a different pint. The pint that I bought was PACKED with the cookie chunks - so much so, that it was almost too difficult to properly scoop (which is a good problem, haha). Excellent review! I can't wait to try these for myself - I'm hopelessly addicted to salted caramel anything, and you probably got a bad pint of Snickerdoodle so I'll take my chances and see if I can score some more mix-ins! I agree with Cam Gill in that you should review more of So Delicious products! I've heard the soy ice cream from Trader Joe's is excellent. I'd like to see how it compares to this line. 1st commenter, have you ever tried asking the frozen food manager to order new products? I've built a relationship with one of mine and he can get me mostly anything I want ordered to the store. Stride, I've had a few bums from So Delicious but they're a reliable brand for a non-dairy option. Cam, I have reviewed a handful of their flavors for the blog and plan to try out more in the future! Liz, thanks for the feedback. I was planning on trying it again anyway just because it reminded me so much of Dunk-a-roos. Caitlin, thanks for the kind words. Let us now your thoughts on the flavors when you get to try them! Anne, I've looked over their cherry soy flavor a bunch of times but never pulled the trigger on buying it. I'll have to change that soon. Nick- I had thought about it, but I'd imagine dairy free ice cream moves a heck of a lot slower than regular ice cream and I imagine they'd be afraid of getting stuck with stuff they can't sell. numbers/letters, it never hurts to ask. If they have a dairy free option that's not selling, they can always replace it with the new flavor and see how that sells. Let me know how it goes for you! Just tried the snickerdoodle and alas you got a bum pint. While my pint wasn't at the Ben & Jerry's level of mix-ins, there were eight sizable orbs of cookie dough. @Nick, I asked, so we shall see. Hopefully I'll have my spoon in some cashew ice cream in the coming week. 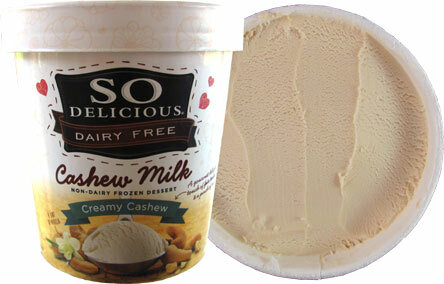 For those who have tried a cashew flavor, AND their soy/almond/coconut flavors, how "present" is the cashew taste? Is it as overhelming as their coconut or subtle/indetectable like their almond/soy flavors? I hope to find the Snickerdoodle someday. I hope Giant will get these in soon. Andrew, thanks for adding your feedback. numbers/letters, I think the cashew flavor is for the most part subtle. It only really comes through a lot in the creamy cashew and salted carael flavors. It's no where near as strong as the coconut milk ones. Anon, I doubt a store like Giant will carry it on their own without asking. I'd look for more "health" oriented shops, co-ops or Whole Foods if I was you. @Nick & Anon: my local Giant stores (Stop & Shop) have varying sized organic/allnatural sections, you might find it in there. I tried the snickerdoodle today. Yes, it's not as creamy as normal ice cream but the dryness and density of it reminded me of the cookie. I really enjoyed it. Very happy to (belatedly) find a non-holiday Snickerdoodle flavor in my area other than the Edy's/Dreyer's custard (and that's a vanilla ice cream with Snickerdoodle mixed in, whereas the So Delicious is a snickerdoodle base with snickerdoodle cookies). I didn't really notice dryness, though I did let the pint thaw for at least half an hour before eating some. Definitely agree about the base being quite good and snickerdoodly. As for the mix-ins, there aren't a ton of cookie pieces, but the ones I got were huge, comparable to 2 or 3 other cookie pieces from Ben & Jerry's or Blue Bell, and the pieces were great, too. 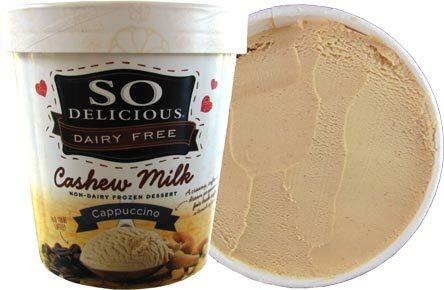 I was a little afraid with "cashew milk", but this tasted pretty much like ice cream to my taste buds. It is a little pricey for a pint, but I enjoyed this flavor enough to add it to my rotation. Tried a second batch of this and might downgrade my rating from an 8.5/10 to an 8. 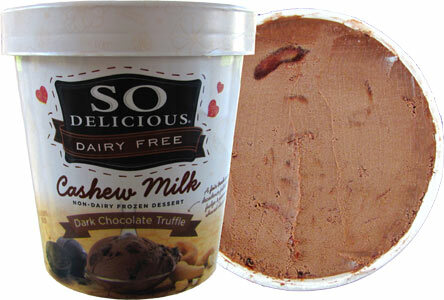 Rather than pairing it with some coconut-based ice cream that I did not like, I ate this pint with some (budget) ice cream and did notice more of a cashew taste that wasn't typical (dairy-based?) ice cream. It wasn't necessarily bad (kind of like I how almond milk tastes different than dairy milk), but my previous post made it sound like I couldn't taste a difference: I could taste a difference this time, but it wasn't something I disliked. The base ice cream remains good/solid (still don't like it quite as much as Nick), and I got about 8 good-sized cookie pieces (which manage to have the soft texture of a warm cookie rather than being uncooked cookie dough or hardened cookie pieces) rather than 4 or 5 in the previous batch (not sure whether my 8 or or Nick's 2 is the outlier; it obviously would feel like there were more pieces if they cut them in half, but I really enjoy finding the big pieces that are in there, plus I can always just break up the pieces if I want them more dispersed throughout the entire pint); they remain outstanding, though it might be cheaper/easier to find/bake some soft snickerdoodle cookies and throw them in the microwave for a few seconds (or eat them fresh out of the oven). Still definitely recommend it if you like Snickerdoodle; maybe just wait until it is on sale if you have any concerns about the cashew milk. "If you have to go dairy free, there's better chocolate options on the market." I agree with some of the others.. the Snickerdoodle pint that I just got was PACKED with cookie dough gobs. I hope you get ANOTHER pint of it--you deserve it!!! Currently having the cashew milk very vanilla and it is very delicious. 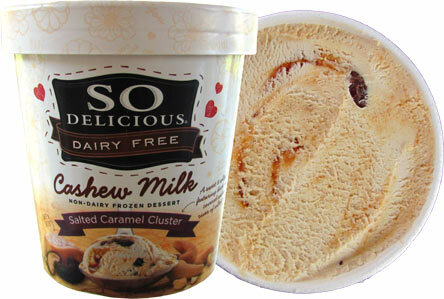 It is so delicious i can't believe its dairy free!